Allahabad High Court ARO Stage I Result 2019 Check Here. Allahabad High Court APS Stage I Result 2019 Check Here. Allahabad High Court Driver Stage I Result 2019 Check Here. AHC APS Final Answer Key / OMR Sheet Check Here. AHC ARO Answer Key Check Here. AHC APS Answer Key Check Here. AHC Driver Answer Key Check Here. Allahabad High Court APS, ARO And Driver Stage II Admit Card Check Here. AHC APS, ARO And Driver Admit Card Check Here. AHC APS, ARO And Driver Exam Notice Check Here. AHC Notification is out. AHC is recruiting for 341 APS, ARO And Driver Govt Job Stage II Mains Posts. 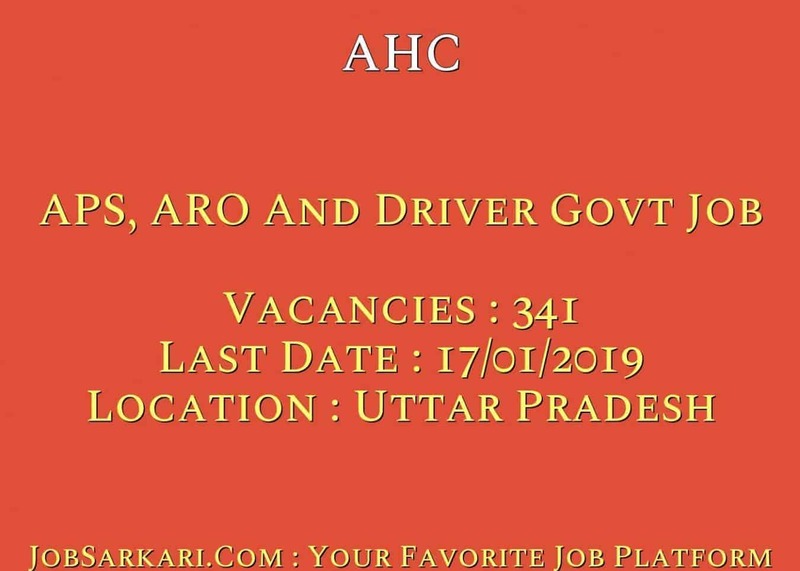 You can check AHC - Allahabad High Court last date, download AHC notification, visit AHC official website and check other AHC Vacancy details.Complete Vacancy and recruitment Details about 341 APS, ARO And Driver Govt Job Stage II Mains vacancies in AHC are provided below by JobSarkari.Com only for you. Last Date of Apply Online. 07/01/2019. Last Date of Pay Application Fee. 07/01/2019. Mode of Payment. Candidate Can Pay Application Fee Through Net Banking, Debit Card And Credit Card or E Challan. Additional Private Secretary (APS). Candidate Must Have Passed Bachelor Degree in Any Discipline And Having 100 WPM English Short Hand Speed And 40 WPM English Typing Speed. 23. Assistant Review Officer (ARO). Candidate Must Have Passed Bachelor Degree in Any Discipline And Having Knowledge of Computer. 277. Driver Grade IV. Candidate Must Have Passed Class 10th And Having Valid Driving License of 5 Years. 41. For Additional Private Secretary (APS)/ Assistant Review Officer (ARO). Min 21 And Max 35 Years. For Driver Grade IV. Min 18 And Max 35 Years. 3. Candidate Can Fill All the Details in Application Form And Need to Upload All Mandatory Documents. 4. Candidate Can Apply online Before 07th January 2019. Q. What is the Last Date For AHC APS, ARO And Driver Govt Job Stage II Mains Vacancy ? A. 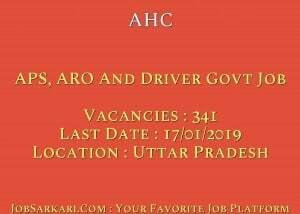 Last Date for AHC APS, ARO And Driver Govt Job Stage II Mains Posts is 07/01/2019. Q. What is the Form Type of AHC APS, ARO And Driver Govt Job Stage II Mains Recruitment ? A. The Form Type for AHC APS, ARO And Driver Govt Job Stage II Mains Posts is Online. Q. How many vacancies are available in Allahabad High Court APS, ARO And Driver Govt Job Stage II Mains Posts ? A. There are about 300 Vacancies in Allahabad High Court APS, ARO And Driver Govt Job Stage II Mains Posts.